That's right, construction began Sept. 11, 1935 near Cumberland Knob!! The Blue Ridge Parkway was the brainchild of President Roosevelt, who envisioned a national highway that followed along the mountain tops. More than 250 of the entire 469 mile parkway winds through North Carolina's mountains. Loaded with breathtaking views at nearly every turn, the parkway is a popular destination or journey. Relax anywhere along the route and enjoy your tax dollars at work. The National Park System provides excellent facilities for camping, picnicking, hiking, and cruising. Nearby communities also provide the modern conveniences that some folks just won't compromise. 15 million annual visitors can't be wrong!! For weather-related closures which can change rapidly this time of year, call the park information line at (828) 298 0398. Nothing much to do where you live? Can't decide where to go and what to do? Hit the Blue Ridge Parkway for an afternoon drive. 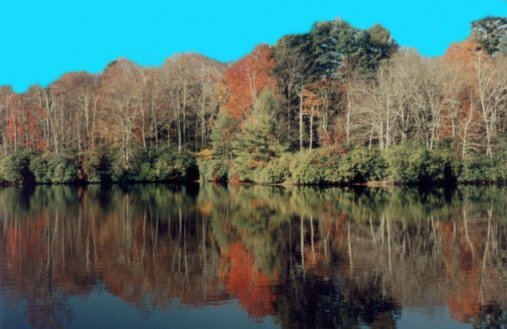 Whether tis' the season for enjoying the fall foliage, spring's awakening, or summer splendor, this is the place to be seen or not to be seen. Elevations vary along the parkway between three and six thousand feet quite regularly! Therefore, always prepare for any of mother nature's extremes at any time. Reports of snow atop Mt. Mitchell in June have occurred. The Blue Ridge Parkway provides unlimited detours for the curious explorer. We recommend the Nike approach. Many diversions are a plenty including but not limited to the following waterfalls: Looking Glass Falls, Yellowstone Falls, Crabtree Falls, or Linville Falls, along the parkway. American Motorcyclist named 3 roads in Western NC among the top 15 best in America to ride. AMA members ranked The Blue Ridge Parkway # 2, US 129 The Dragon #3, and The Cherohala Skyway #7. If you enjoy taking a hike, than the parkway can be a fantastic destination during any season. There are dozens of trails along the parkway to hike, but just beware that many times the length of the trail you are about to venture upon is listed as one way. Have you ever hiked a 1.5 mile trail only to be discouraged by the dreaded return hike? If you really enjoy hiking, you can't beat Grandfather Mtn., especially in the fall. Invest in a season pass to take full advantage of the entire mountain all year long. McRae's peak, the attic window, the mile high swinging bridge, or the nature reserve all offer something for everyone. Certainly a year's worth of family recreation and entertainment that can't be accomplished in a only one day! 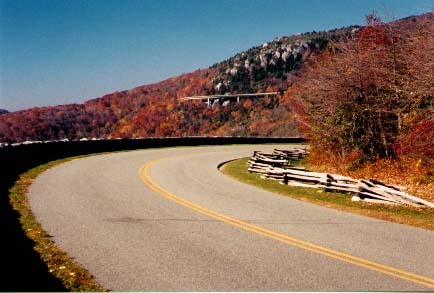 If you arrive their via the parkway, chances are you'll travel over the Linn Cove viaduct, which upon its completion, linked the northern and southern parts of the parkway.